For millennia, the Iberian Peninsula has been a coveted destination, with everyone from the Phoenicians and the Romans to the Visigoths and the Moors leaving their mark on this southwestern slice of Europe. Today, millions of visitors flock to Spain and Portugal, drawn in by the countries’ enthralling cities, wonderful food, wine, and diverse landscapes. Overlooked by the snow-capped peaks of the majestic Sierra Nevada, Granada is home to a lively student population, eateries dishing out free tapas, and glorious remnants of its Moorish past. Granada’s most famous attraction is the Alhambra, an awe-inspiring palace and fortress that was constructed by the Moors over the course of a few centuries. The Alhambra’s Islamic architecture (think horseshoe arches, graceful fountains, and vibrant tiles decorated in geometric patterns) might make you feel as though you have been whisked off to Morocco. You can easily fill an entire day exploring the Alhambra’s magnificent grounds, which also include the Generalife, the tranquil summer resort of the rulers who constructed the Alhambra. Given the Alhambra’s tremendous popularity, it is advisable to secure tickets online far in advance—especially if you are visiting during the peak tourist season. After you have savored the Alhambra, stroll through Albayzín—Granada’s hilly neighborhood filled with centuries-old whitewashed buildings. This district is dotted with Arabian-style teahouses (teterías), flamenco establishments tucked into caves, and homes decorated with eye-catching blue pottery. For superb sunset views of the Alhambra, head to the Mirador San Nicolás viewpoint. In this small square, tourists mingle with locals playing the Spanish guitar, all while watching the Alhambra blush in the last light of the day. If you’re feeling especially energetic, climb even higher—up to the Ermita de San Miguel Alto. This hilltop affords splendid views of the Alhambra, the Sierra Nevada, and the rooftops of Albayzín. As you walk back downhill to Granada’s attractive center after the sun has set, you’ll find that Albayzín looks especially atmospheric when the lanterns of its Arabian-style shops are all aglow. Another of Granada’s star attractions is the 16th century Royal Chapel of Granada (Capilla Real). Queen Isabella and King Ferdinand (the so-called “Catholic monarchs” who were instrumental in taking Granada from the Moors in 1492) are buried in this chapel’s crypt. 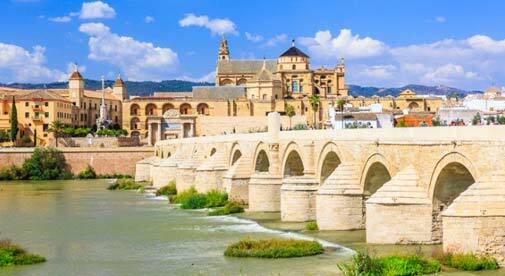 For centuries, Córdoba was the Moors’ capital and one of Europe’s most sophisticated cities, boasting esteemed universities, libraries, and public bathhouses. 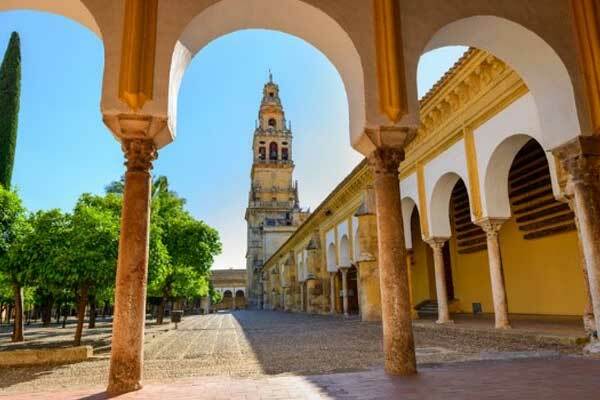 It is said that Córdoba’s Muslims, Jews, and Christians lived harmoniously here, creating a dynamic community where knowledge and talents were shared. Córdoba’s most famous attraction is its magnificent Mosque-Cathedral (Mezquita), which marries monumental Islamic—and Christian—architecture. During the late 8th century, the Moors started the construction of the mosque on the site of what was previously a Visigoth church. Over the course of a few hundred years, they continued to enlarge the mosque, eventually creating a breathtaking building that has nearly 900 columns, and that incorporates golden mosaics into some of its most sacred sections. When the Christians recaptured Córdoba from the Moors in the 13th century, they left the mosque largely intact. However, in the 16th century, a massive section of the mosque was removed so that a Christian cathedral could be constructed inside. So elaborate was the cathedral that it took centuries to build. If you’d like a bird’s-eye view of the complex, it is possible to climb to the top of the bell tower, which was constructed around the mosque’s minaret. Tickets often sell out, so it is recommended to arrive early in the morning to secure your spot. Long before the Moors ruled Córdoba, the Romans also left their mark throughout the city. Today, you can still see the ruins of a Roman temple, as well as an attractive Roman bridge (Puente Romano). Since the bridge is pedestrianized, it is a delightful place to stroll and take in views of Córdoba’s Old Town skyline. You’ll likely be serenaded by musicians, and you might even glimpse a flock of sheep grazing on the banks of the Guadalquivir River. As you explore the windy lanes of Córdoba’s Old Town, you pass by bustling tapas eateries, as well as Arabian teahouses with inviting courtyards. Wander into one of these courtyard gardens, where you can enjoy tea and delightful Middle Eastern pastries all while watching birds begging for a sweet morsel. Córdoba’s Old Town is known for its charming patios, which are studded with a colorful array of potted plants and other greenery. In May, local residents competing in the Patios Festival (Fiesta de los Patios) open these private courtyards to flower enthusiasts and tourists alike. Known as the “City of Three Cultures” since it was once home to a thriving Christian, Muslim, and Jewish population, Toledo plays host to a cathedral of epic proportions, a 10th-century mosque, and two impressive synagogues. The Toledo Cathedral (Catedral de Toledo) is often described as one of Spain’s finest. Its architecture is overwhelmingly Gothic, but it also has elements of Renaissance and Mudéjar design. Inside the cathedral you can find paintings by Spanish masters such as Velázquez and Goya, as well as El Greco, the Greek artist who lived in Toledo for much of his life. 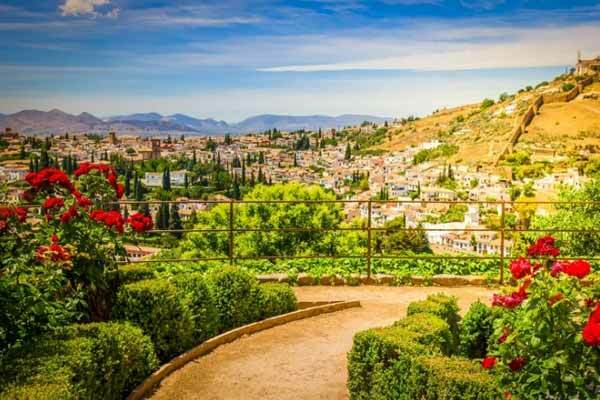 If you’d like to see more of El Greco’s work, including religious paintings and his celebrated canvas depicting the city of Toledo itself, be sure to head to the El Greco Museum (Museo del Greco). Toledo’s two remaining synagogues are also well worth a visit. The 14th-century Sinagoga del Tránsito showcases beautiful Mudéjar architecture, with refined stucco work that depicts natural motifs, as well as lace-like horseshoe arches. This former place of worship also houses the Sephardic Museum, whose artifacts help shed light on the Iberian Peninsula’s once-thriving Jewish population. Just up the street is the 12th-century Sinagoga de Santa María La Blanca. Its graceful white arches are dramatically illuminated by uplights, inviting you to marvel at the intricacies of the magnificent architecture. Thanks to its commanding position and impressive size, the Alcázar is one of Toledo’s most recognizable buildings. A Moorish fortress, royal residence, and a military academy once stood at this site. At the start of the Spanish Civil War in 1936, the Alcázar was badly damaged. Franco, Spain’s long-ruling military dictator later had it rebuilt. Today, the mighty structure houses an extensive military museum. Toledo has also long been a famous sword-making center, thanks to its strong steel and talented blacksmiths. If you’re in the market for a souvenir sword, or perhaps a kitchen knife, you’ll be spoiled for choice, as Toledo’s shops are brimming with steel souvenirs. And it’s not just fine cooking accessories that make Toledo a culinary paradise, because the city is also known for its saffron, its fine marzipan, and Manchego—cheese made from sheep’s milk. As you walk Toledo’s steep streets, you’ll be wowed by the extent of the city’s walls. These fortifications are a progressive effort—the Romans, Visigoths, Moors, and King Alfonso VI (who took Toledo from the Moors) all left their mark. 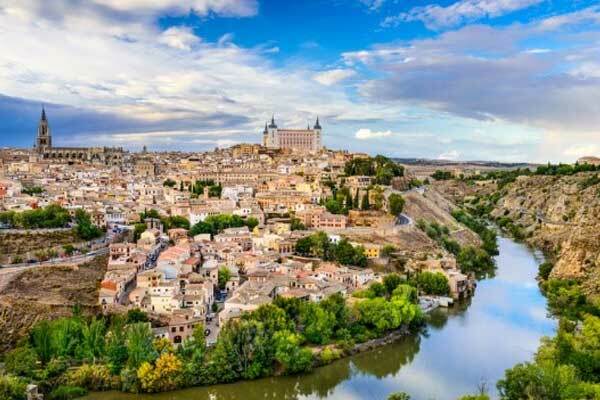 Toledo is a popular day-trip for tourists visiting Madrid, as it is only 45 miles away. Frequent bus connections link the two cities. 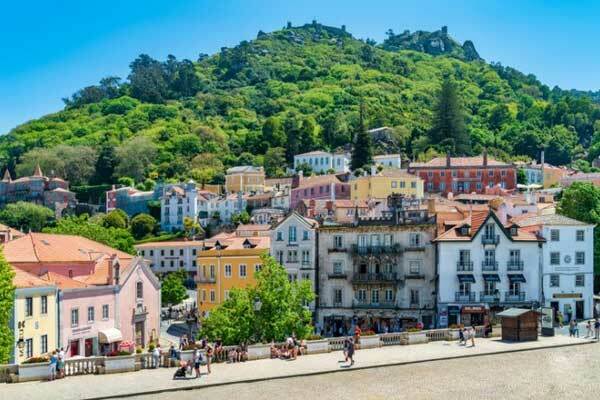 Located on the Portuguese Riviera, the refined city of Sintra boasts dreamy palaces and castles, magnificent gardens, and a dramatic hilly setting. Long a refuge for Portugal’s royalty and elite, much of Sintra is included on UNESCO’s World Heritage List. With so many worthy sites to visit in Sintra, it can be difficult choosing where to go—particularly if you only have one day. The Moorish Castle (Castelo dos Mouros) offers magnificent views of the Atlantic, especially if Sintra isn’t veiled in fog. The 10th-century castle’s grey-stone ramparts crown a hilltop roughly 1,350 feet above sea level. As its name implies, the castle was constructed by the Moors. However, successive rulers, as well as the great earthquake of 1755, altered the look of the fortifications. While the Moorish Castle was built with defense and function in mind, the Pena Palace (Palácio da Pena) is decidedly romantic and flamboyant. Featuring lemon and tomato-colored wings, the Pena Palace was built for King Ferdinand II in the mid-19th century. Its flamboyant exterior makes it a favorite with photographers, and since it is perched on one of the area’s highest peaks, it provides stunning vistas, too. Situated in the heart of Sintra’s Old Town, the Sintra National Palace (Palácio Nacional de Sintra) stands out, thanks to its whitewashed exterior and a pair of overturned, funnel-like chimneys. While the Moors originally constructed parts of the structure, Portuguese monarchs later increased its size. The palace’s interior is a delight to explore, thanks to its eclectic Manueline and Moorish styles. You’ll find grand rooms adorned with blue-and-white tiles depicting scenes of Portuguese life, as well as courtyards decorated with Moorish-style tiles. Sintra’s lines can be long, so consider purchasing your tickets online and in advance. Also, Sintra is only 20 miles from Lisbon, Portugal’s capital, making it a wonderful day-trip. The two cities are conveniently linked by train. Home to Portugal’s most esteemed university, the city of Coimbra has a rich history and a youthful vibe. Long before it became known as Coimbra, the city was settled by the Romans and called Aeminium. For a time, Coimbra also served as Portugal’s capital. Coimbra’s star sight is the Joanina Library (Biblioteca Joanina), which along with several other university buildings, is a UNESCO World Heritage site. This magnificent baroque library was constructed during the 18th century. Its interior features handsome book stacks adorned with golden flourishes and furnished with tables made out of exotic wood. The treasured collection of approximately 60,000 books is slowly being digitized. However, to keep the originals safe, a resident colony of bats lives inside these elegant surroundings—kept there so as to devour any insects that might otherwise destroy the books. During your daytime visit, it’s likely that the bats will be sleeping somewhere among the shelves. Other historic university attractions include the Royal Palace, Chapel of St. Michael, the historic Physics Laboratory, and the Natural History Collection. While in Coimbra, it’s a joy simply strolling up the steep streets along the mosaic-tiled sidewalks (called calçadas), trying a shot of ginja (a traditional Portuguese liqueur made with a sour cherry-like fruit), or popping into a club to listen to Portugal’s traditional fado music. Coimbra’s version of fado often includes lyrics about university life. As you explore the town, you’re likely to brush shoulders with students wearing traditional uniforms, which consist of a full-length black cape, tie, white button-down shirt, and a skirt or pants. Coimbra has several lovely greenspaces, which are a superb place to admire Mediterranean flora, read a book, or simply relax. The Botanical Gardens of the University of Coimbra are the city’s most well-known park. They were established in the 18th century, and feature attractive fountains and archways, a greenhouse, and an impressive array of flora, including camellias, calla lilies, bamboo, and trees from around the world. In addition to having aesthetic appeal, the garden enhances the university’s medicinal studies, and researchers also maintain a seed bank. 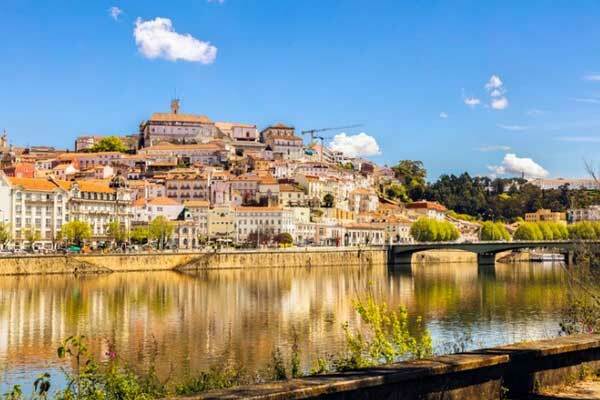 Afternoons in Coimbra are made for walking along the Mondego River, popping into a pastelaria to enjoy Portuguese pastries and coffee, or admiring the details of the Igreja de Santa Cruz church, whose architecture mostly dates back to the 16th century. Portugal’s first kings are buried there. The northwestern city of Porto is Portugal’s second-largest city. 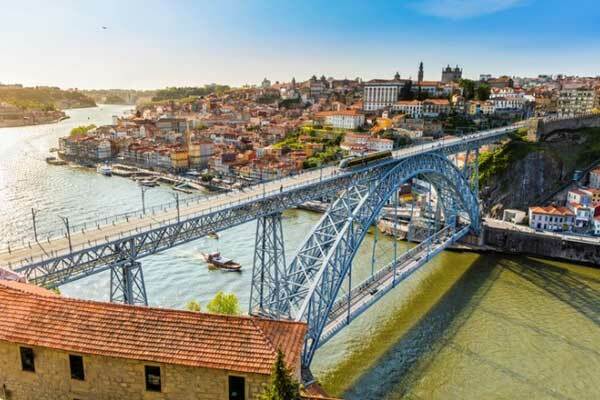 This coastal metropolis is known for its port wine, the Dom Luís I Bridge (which has metalwork reminiscent of the Eiffel Tower), and its beautifully-worn buildings, some of which are clad in stunning blue-and-white tiles called azulejos. In Vila Nova de Gaia, across the river from Ribeira, numerous wine lodges offer the chance to taste—and buy—port wine. Porto is also becoming more and more known for its gastronomic offerings, with upscale restaurants and humble taverns serving up something for every palate. Whatever you choose to eat, you cannot leave the country without trying Portugal’s ultimate crowd-pleaser—the pastel de nata. It is a dainty custard tart, made out of puff pastry, and sprinkled with cinnamon. Where is the Iberian Peninsula? The Iberian Peninsula is located in southwestern Europe, bordering the Atlantic Ocean to the west, the Bay of Biscay to the north, and the Mediterranean Sea to the south and east. The peninsula’s southernmost point is not far from Africa, with the two continents separated only by a narrow strip of the Mediterranean called the Strait of Gibraltar. The name “Iberian Peninsula” is most commonly used to refer to Spain and Portugal, as these two countries comprise most of the peninsula’s landmass. However, the peninsula technically includes the tiny country of Andorra, a sliver of France, and the British Overseas Territory of Gibraltar. The Spanish capital, Madrid, as well as the Portuguese capital, Lisbon, feature major international airports, big-city amenities, and dynamic cultural offerings. Other large cities on the Iberian Peninsula include Barcelona, Valencia, Seville, Zaragoza, and Malaga in Spain, as well as the city of Porto, in Portugal. The Iberian Peninsula is well connected and can be reached via plane, bus, train, and by boat. 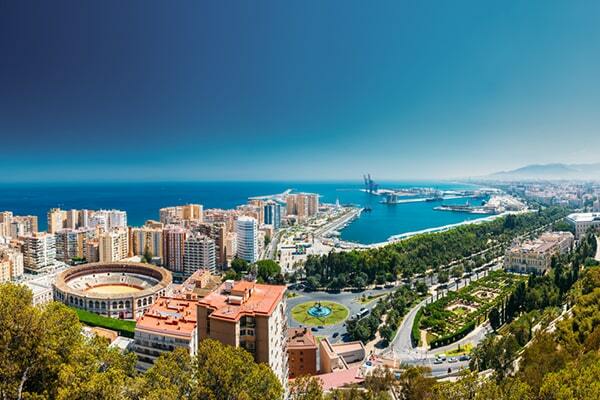 Popular Spanish ports of call include Barcelona, Malaga, Valencia, and the island of Mallorca. 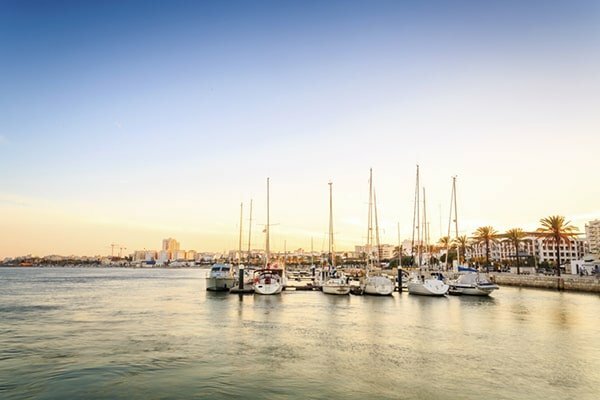 Cruise ships often dock in Gibraltar, as well as the Portuguese cities of Lisbon, Portimão in the Algarve region, and Leixões, just a few miles from the popular destination of Porto. The Portuguese island of Madeira is another sought-after destination for cruise enthusiasts. Ferries link the south of Spain with Morocco. Ferry routes also connect the Spanish mainland to the Canary Islands, as well as the Balearic Islands. Spain, Portugal, and France are all members of the European Union. They are also part of the Schengen Area, which is made up of 26 European countries. (Citizens of the United States and Canada are generally only allowed to spend 90 days within a 180-day period inside the Schengen Area.) Andorra is a de-facto member of the Schengen Area, as the principality can only be accessed via its Schengen neighbors, France and Spain. Gibraltar is not a part of the Schengen Area. Iberia has diverse landscapes, which offer opportunities to participate in an array of water sports, as well as hiking, biking, and even skiing. 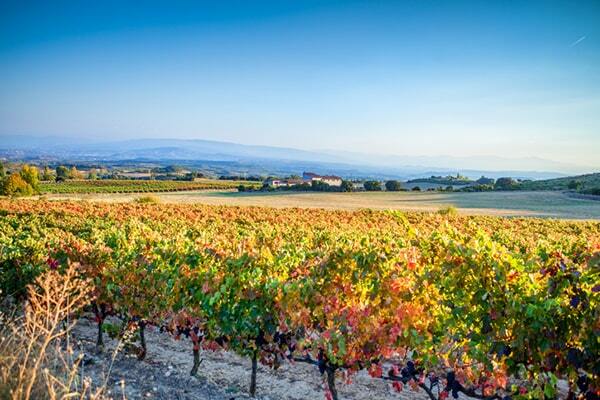 The region also produces an abundance of fresh fruits and vegetables—including a vast share of the world’s olive oil. In addition, the peninsula is home to several renowned wine-growing regions, including La Rioja and La Mancha in Spain, and the Douro and the Dão in Portugal. Part of the Iberian Peninsula is mountainous and rugged, with the Pyrenees creating a natural border between Spain and France. The peninsula is also home to continental Spain’s highest mountain peak, Mulhacén. Parts of Spain and Portugal are also characterized by flat plains, and Spain even has some desert areas. Sun-drenched coastal areas define the peninsula’s south. Some of the most developed resort areas can be found in Portugal’s Algarve region, as well as Spain’s Costa del Sol (Sun Coast). Away from mountainous areas, the Iberian Peninsula’s climate is overwhelmingly Mediterranean—with mild, sometimes-wet winters, and hot, dry summers. The climate along Portugal and Spain’s Atlantic coastlines offers cooler summers. Precipitation is also more frequent along the Atlantic. In inland areas, the climate is more continental, characterized by cooler winters.